As we were driving up North to Sault Ste Mary, passing through the city of Saginaw, we thought it would be interesting to see some Republican campaigning. Until now we had mostly met young, progressive people who either supported the Democratic Party or wished that they didn’t have to choose between either of the two candidates. 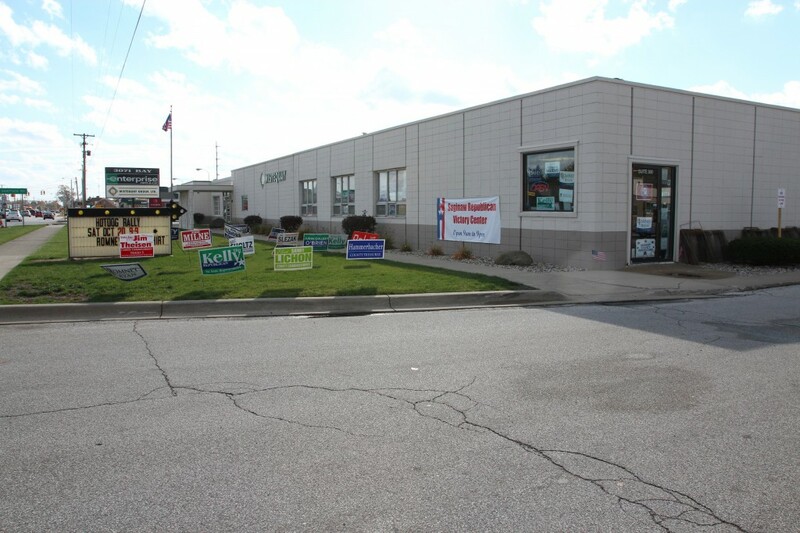 A quick search on the internet revealed that Saginaw happens to have one of the Republicans’ so-called “Victory Centers”. We decided to drive by their office and see what it is about. At the Victory Center, we met Helene Wiltse, chair of the Saginaw County Republican Party. She explained to us that a Victory Centre is a temporary office, coordinating the Republican campaign on a local level. The candidates for the county and the campaign volunteers meet there to discuss their strategy and the next steps that have to be taken. Interested voters can call or pass by if they have any questions about the Republican campaign. Helen Wiltse and her team want to make sure that all the absentee votes are collected before the day of election. Of course, they also want to mobilise the voters for the Republican Party. The volunteers explained to us that one of the most important things is to make sure that supporters put up signs in their front yards, so that undecided voters can read the names of the candidates everywhere. Another important task is the meticulous door-to-door campaigning. For every house they go to, they have an information sheet with a bar code on it. We don’t know exactly what the bar codes are for and didn’t dare to ask, but they give an idea of how well organised these campaign offices are. When we told them about our Tocqueville-roadtrip, one of the volunteers, Albert Menard, suggested that we see the Castle Museum of Saginaw. The recently retired physics professor from Saginaw offered to show us the site. It was designed by William Martin Aiken, the Supervising Architect of the US Treasury from 1895 to 1897. 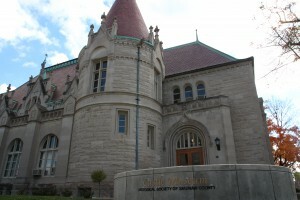 The Castle, or as he called it, the “château”, was built in 1898 as a United States Post Office and now hosts the Historical Society of Saginaw County. Mr. Menard told us that the architect was most likely inspired by Alexis de Tocqueville. “As the castle was modelled after some famous French castles”, he told us, “it makes sense that the architect had Tocqueville in mind. After all, he possessed one like that back in France.” Indeed, Tocqueville descended from an old Norman aristocratic and possessed a castle. But looking at pictures of it, the connection between his home in France and the post office in Saginaw wasn’t all that clear to us. 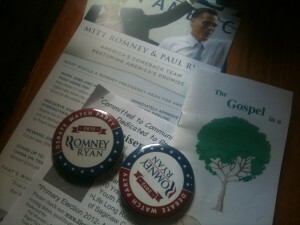 Mr. Menard took us back to our car and handed us some information material about the Republican Party and a bunch of Romney-Ryan-badges. Now we can add these badges to our “The Gospel in a Nutshell”-booklet that we got this morning from a trucker. We met him while having breakfast in a cheap motel. I don’t know if he thought we needed to be saved or just wanted us to have save travels. Anyway, we are starting an interesting collection of travel souvenirs, don’t you think? What does “cheap motel” actually mean these days? Hahahaha! What do you think? The barcodes on the run sheets are for volunteers to scan with their smartphones – the CRM application then pulls up all available information on the voter. Ha, that’s what we thought! Can you imagine which consequences this way of campaigning would have here with all the “Datenschutz”-laws? People would just freak out!